Sombrero Galaxy Mosaic - Universe Galaxies And Stars Section. Hubble Space Telescope Mosaic of the Sombrero Galaxy. Hubble Space Telescope Mosaic of the Sombrero Galaxy: Image credit: Hubble. The newest image from the Hubble Space Telescope is of the Sombrero Galaxy, which was pieced together from a mosaic of six images taken by Hubble's Advanced Camera for Surveys. 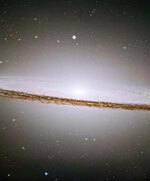 The Sombrero Galaxy is quite large; visually it's one-fifth the size of the Moon in a telescope. This release marks the fifth anniversary of the Hubble Heritage Project, which uses telescope time to release beautiful astronomy images to the public. The Hubble Heritage Team of astronomers, who assemble many of the NASA Hubble Space Telescope's most stunning pictures, is celebrating its five-year anniversary with the release of the picturesque Sombrero galaxy. One of the largest Hubble mosaics ever assembled, this magnificent Galaxy is nearly one-fifth the diameter of the full moon. The team used Hubble's Advanced Camera for Surveys to take six pictures of the Galaxy and then stitched them together to create the final composite image. The photo reveals a myriad of stars in a pancake-shaped disk as well as a glowing central bulge of stars. Since its inception in 1998, the Hubble Heritage Project has released more than 65 images of dazzling celestial objects, including planets, dying stars, regions of star formation, clusters of stars, individual galaxies, and even clusters of galaxies. This has been done on a monthly basis. The Heritage team of Space telescope Science Institute Astronomers and image processing specialists selects images from the Hubble Space Telescope's public data archive. This database contains approximately 500,000 raw images taken over the past 13 years. Although Astronomers use Hubble to photograph numerous celestial objects, those results are usually shared with only the astronomical community. The Heritage team periodically combs the archive looking for interesting, but unreleased, pictures to become Heritage image candidates. "Some of the photogenic objects that have been scientific targets often lack sufficient exposure across a range of colors," explains Keith Noll, the Heritage lead scientist. "In other archival images the telescope's field of view only covers a small, unrecognizable portion of the object, so we have to fill in the rest." The Hubble Heritage Project has been granted a small amount of observing time to essentially "fill in the gaps" in these images. The Heritage Astronomers also seek visually interesting objects in the universe that have not yet been selected for Hubble scientific observations. For the Sombrero galaxy, the Heritage program devoted a number of orbits to complete a photo mosaic of the object. Public visitors to the Heritage website (http://heritage.stsci.edu) have also been invited to help select attractive astronomical targets. One overwhelming choice of the voters was the famous Horsehead Nebula in the constellation Orion the hunter. The Heritage program has been recognized for its contribution to inspiring the public with some of the most photogenic images ever produced in astronomy. Recent achievements for the team include the Astronomical Society of the Pacific 2003 Klumpke-Roberts award for "outstanding contributions to the public understanding and appreciation of astronomy." In 2002, two Heritage images were selected in the Rochester Institute of Technology's "Images From Science" travelling gallery exhibit. Several images have been selected by the US and UK postal systems. In 2000, a first-class US postage stamp showing the Ring Nebula was one of five Hubble images selected to be part of a commemorative series of stamps honoring Astronomer Edwin P. Hubble. Hubble's new Advanced Camera for Surveys, and eventually the planned Wide Field Camera 3, promise to give the Heritage team an opportunity to share with the public even more opulent views of our colorful universe.